Full Trunking Control Through Software. PRO-2052 BC780 and UBC780 Trunktrackers ! YES - Scancat supports the ''European'' UBC Bearcats! and Memory loader just for the BC-296, BC-796, BC250, BC785, BC780, UBC780, BC895, BC245 and PRO2052. 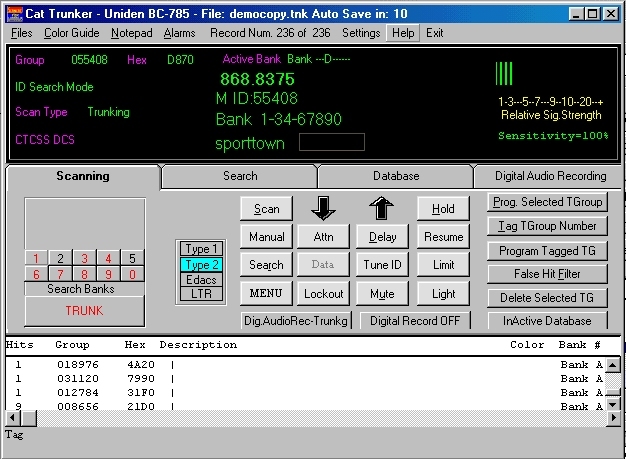 (BC780 screen illustrated below) . 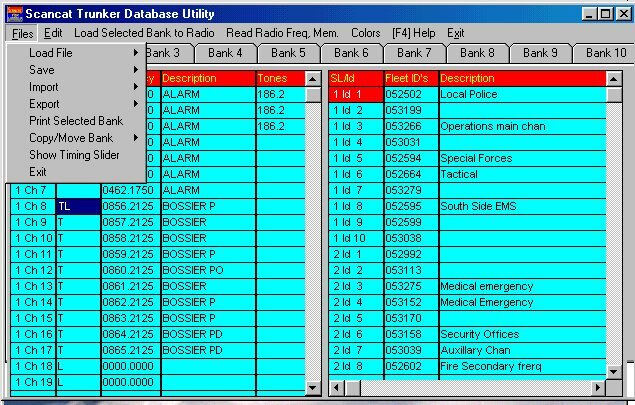 Load Frequencies and Talk Group ID's to these radios By Bank Or a single record- just a click and that's it! Scancat-Gold for Windows is proud to announce support for the newest addition to our Scanner Lineup, The BC-296, BC-796, BC-780, BC250 and BC785. Additionally we support the PRO-2052, BEARCAT BC-895 and BC245 TrunkTracker. And what's so great is... Scancat supports all radios in one single program! These unique desktop scanners from Radio Shack and Uniden have 300 to 1000 memories that can be programmed for either conventional or Trunking Channels. In addition the BC250, BC785 and BC780 can be programmed with ALPHA (text) Tags! Scancat is aware that there is a potential problem with a limited number of read/write cycles on NVRAM chips in the BC780 and other similar Scanners. To this end, Scancat does NOT write to the NVRAM chips during its scanning operations. In fact, SCANCAT has devised its operations in a way that allows safe conventional scanning, a feature that many other software programs have failed to do! Scancat can control all the conventional operations of the PRO-2052, BC-296, BC-796, BC-250, BC-785, BC-895, BC780, UBC780 and BC245 such as scanning, logging, spectrum analysis etc., plus permit you to selectively load the banks of the radio with all your favorite trunking frequencies. Of course, Scancat can also read the radio's memory contents to files including trunking information. With Scancat's support of over 65 radios, from over 10 Manufacturers, your software dollars go a long way and there is no need to buy several programs for each radio you own. The chances are high that we already support all of your existing scanner and receiver equipment and the best part is....all the equipment is supported in one program, no need to purchase seperate "drivers". Now, with the release of Version 8.0 Scancat fully supports all these trunking features in addition to conventional scanning. Just look what we added ! New Search Funtions - Find those hidden frequencies! Easier Database management and editing! Just Click and immediately hear the recorded transmission! A new ''Tabbed style'' interface packs tons of new features into a simple mouse clickable interface! A completely separate scanning module just for the BC-296, BC-796, BC250, BC785, PRO-2052, BC895, BC780, UBC780 and BC245 TrunkTrackers ! Program the BC780 , the new BC250 and BC785 with ALPHA (text) Tags! Auto logging (with duplicate check) of all group numbers as they become active, GREAT FEATURE!! Automatically places 'standard descriptions' of trunking groups into the database for you. Scancat's new S-Meter - really cool ! Scancat offers user selectable colors. Choose any one of 12 colors (per record) for a 'group or service'. Use for instant visual identification of Police, Fire, Medical etc. Scancat has a hit counter AND time stamp. Scancat offers 50 character description PLUS 70 character comments. SCAN trunkgroups and change banks while trunking with the click of the mouse. Sort on any field in ascending or descending order. Export to Comma Delimited "SDF" files. Unlike the Radio in "non computer" control, you can easily change banks with a single click. Even 'conventional scan' the loaded memories from the computer. Buy our latest Scancat-Gold for Windows NOW! Start enjoying the full capabilities of the BC-296, BC-796, BC250, BC785, PRO-2052, BC780, UBC780, BC895 and BC245 ! In addition, we can supply the serial cable that is necessary to connect the BC-895 to a computer. Buy the Software and Cable as a package, and save even more ! Need more signal for those distant Trunking systems? 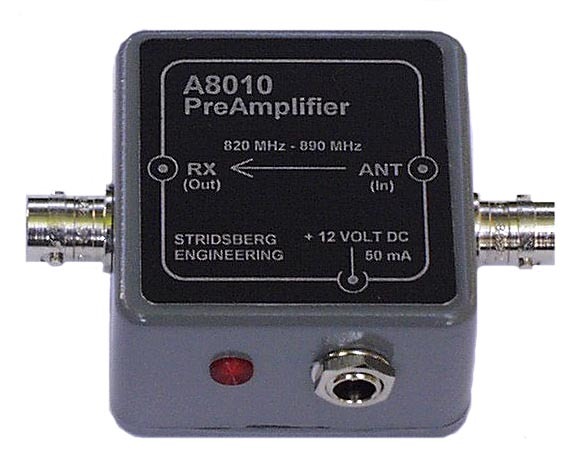 This Stridsberg 800 MHZ Preamp may be the answer! International Money Orders - MasterCard / Visa / Amer.Exp.